James Thomason was born on 3 May 1804 at Shelford in Cambridgeshire, the son of Thomas Truebody Thomason 1774-1829 and his wife nee Elizabeth Jane Fawcett. He was baptised on 19 June 1804. He went to India as a child with his parents. When ten years old he was sent to school in England, and, having obtained an appointment to the Bengal Civil Service, moved to Haileybury College. He went to Calcutta in 1822 aged eighteen, and quickly became proficient in Indian languages. James Thomason married Maynard Eliza Grant on 18 March 1829 at English Bazaar in India (1). She was the daughter of James William Grant 1788-1865, Laird of Elchies near Elgin in Scotland (2). His earliest service was in the judicial department. But in 1832 he became Magistrate and Collector at Azamgarh so as to gain administrative experience and practical knowledge of district work in direct contact with the people. In 1837 was appointed Secretary to the Government of Agra. However in 1839 his wife's ill health compelled him to return with her to England, his post being kept open for him. 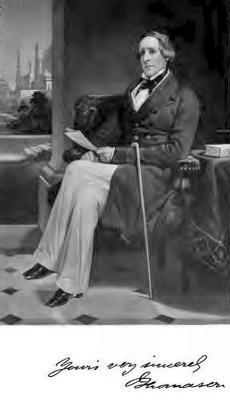 James Thomason returned to Agra in 1840, and in 1842 was appointed Foreign Secretary to the Government of India. In the following year he became Lieutenant-Governor of the North-Western Provinces, which office he held until his death in 1853. Throughout his long term of office his abilities and energies were devoted with unparalleled success to the well-being of his province. His directions to settlement officers and to collectors of land revenue long remained their official guide. He improved communications, police protection, and social services. He established many locally supported elementary schools in key villages, providing vernacular education for children throughout the region. In 1847 he founded a College of Civil Engineering at Roorkee, to train engineers for public works including the Ganges Canal begun in 1842. At that time such colleges for training civil rather than military engineers were unknown even in England. After he died it was named Thomason College of Civil Engineering in 1854. It became the First Technical University of India in 1949. Throughout his life James Thomason held strong religious belief in the highest Christian principles, but he carefully avoided taking any measures which might interfere with the religious feelings or prejudices of the people. He died on the day that Queen Victoria appointed him Governor of Madras (3). James Grant Thomason. He was born on 13 July 1830 (4) and baptised at Calcutta on 5 September 1830. Maynard Montier Thomason. She was born on 3 November 1831 at Calcutta (5) and baptised on 11 December 1831. She was married to Dr John M. Hay in 1852 at St George's church, Agra in India. After he died she was married to John James Clifford in 1860 at Cookham Dean in Berkshire. Charles Simeon Thomason. He was born on 25 May 1833 at Azimghur (6) and baptised there on 10 November 1833. He married Ellen Fanshaw Dundas Drummond 1832-1899 in 1858 (7). He died on 12 July 1911. William Stephen Thomason. He was born on 14 September 1835 at Azimghur (8) and baptised on 27 September 1835. Emma Frances Thomason. She was born on 9 February 1837 (9). She was married to William Johnston. Rowland Fawcett Thomason. He was born on 2 May 1838 at Simla in India (10). He died on 28 November 1850 aged only twelve years, and is commemorated on a memorial inscription at Charlton near Woolwich in London. Their mother Maynard Eliza Thomason died at Charlton, and was buried there. James Thomason died on 27 September 1853 at Bareilly in India, and was buried there on the next day. (1) English Bazaar is now known as Malda, in West Bengal. For a biography of James William Grant 1788-1865 see Dictionary of National Biography 1885-1900 volume 22. (3) Dictionary of National Biography 1885-1900 volume 56; Anglo-Indian Worthies H. Morris (1890) pages 66 to 82; James Thomason by Sir Richard Temple (1893); The Honourable James Thomason, Lieutenant-Governor N.-W.P., India 1843-1853 A.D. by Sir William Muir (1897). (4) East India Register and Directory: Birth Announcements from the East India Register (1831). (5) East India Register and Directory: Birth Announcements from the East India Register (1832). (6) East India Register and Directory: Birth Announcements from the East India Register (1834). (7) Transcription of Bengal Marriage Indexes 1857-1864 volume 65 folio 62. (8) East India Register and Directory: Birth Announcements from the East India Register (1836). (9) East India Register and Directory: Birth Announcements from the East India Register (1838). (10) East India Register and Directory: Birth Announcements from the East India Register (1839).